I didn’t know why I wanted to go to China so badly, and I didn’t know how I would manage there, but I knew deep down in my heart that this was an opportunity not tot be missed. My relationship with China began when I was nineteen and I read Lao Tzu’s famous text, The Tao Te Ching. This was at the time was the significant “religious” (although “non-thesist” is a better term) text that the ancient culture had followed for years, an ideology of harmonious coexistence with other animals, the planet, and the universe. I needed to go there. I needed to go to the source. So with a month to prepare my five-year-old daughter for this experience of a lifetime, I set the last week aside for packing, and with a big breath and a small prayer, we boarded the plane to Beijing, at sunrise on Friday. We landed in China at sunset on Saturday, and as we whizzed away from the gigantic Beijing Airport, I knew I was headed for a real adventure. The Peking Yard Hostel had been expecting us, a typical courtyard setting with brightly colored orchids and geraniums in pots. The young girls at the front desk spoke English and made us feel totally at home, and backpackers spotted the couches in the lounge. After a short respite, we ventured out. 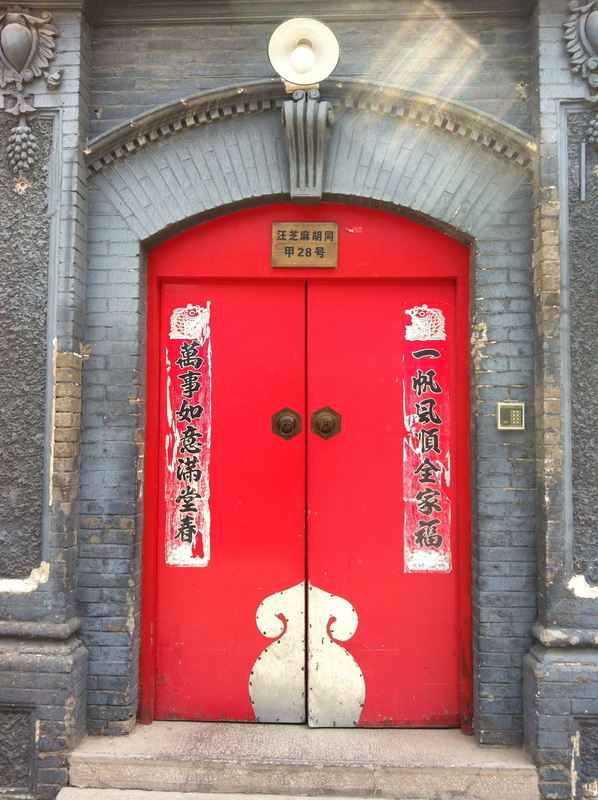 On the plane, I had had the luxury of spending the last hour and half practicing how to say, Wazhima Hutong, Dongsi Bedaije, Doncheng District, when I jumped into the cab. And the driver still didn’t understand me. Little did I know that, number one, I butchered the language, and , number two, that Beijing is made up of thousands of hutongs – tiny alleys where people live and work. Furthermore, there’s no possible way that i a cab driver would know them all – a landmark would have been much more suitable. After first stopping on the main street, he motioned that he could drive in, which I was thankful of since I had no idea where I was going. He went around the block, and after honking his way through people, carts, children, and bicycles, we finally arrived at the hostel’s big red doors. Dinner my first night I wasn’t so lucky. We seemed to be surrounded by hundreds in little restaurants and shops, and I chose a place close by, fearing that Leila may be overwhelmed by all the hustle and bustle (which didn’t seem to be slowing down as the night darkened). It was hot, I was nervous and my total ineptitude for the language became excruciating. Luckily the place was small and no one paid attention; and although Leila ate nothing (pork bacon with chilis, something I thought was chicken), she was happy to connect with the waitress. They played kooky eyes with each other for close to a half an hour, Leila asking repeatedly, “why do you have so many bull frogs under the aquarium?” When my head hit the pillow, I didn’t know whether I was coming or going. It wasn’t perfect, but it was over.